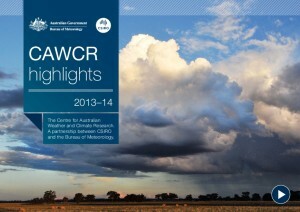 The Collaboration for Australian Weather and Climate Research (CAWCR) is a research partnership between the Bureau of Meteorology (Bureau) and CSIRO. It represents a shared commitment of the Bureau and CSIRO to extend their respective research capabilities through collaboration focused primarily on Earth-system science. Working together on research and delivery, the Bureau and CSIRO can achieve increased impact and benefit for Australia, beyond what either partner could achieve alone. 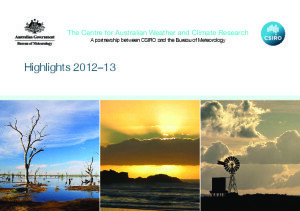 The members of the CAWCR research community are the Bureau of Meteorology’s Research and Development Program, and the Oceans and Climate Dynamics and Earth System Assessment programs in CSIRO’s Oceans and Atmosphere business unit. 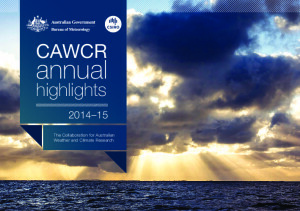 CAWCR’s purpose is to achieve outcomes for Australia through Earth-system science, with emphasis on weather and ocean forecasting, seasonal prediction, climate variability and change, regional and global carbon and water budgets, and science to support national responses to weather and climate-related hazards. Research leaders from both agencies are committed to identifying, developing and conducting high-impact research projects that address national and global needs. At the same time, CAWCR delivers value to the partners by broadening and enhancing their capability and impact, through access to each other’s knowledge, expertise, and infrastructure.